We flew from Singapore to Denpasar International Airport (DPS) non-stop, the flight was about 2.5hours. Arriving in Bali, we took a taxi to the hotel, it was about 15 minutes ride. 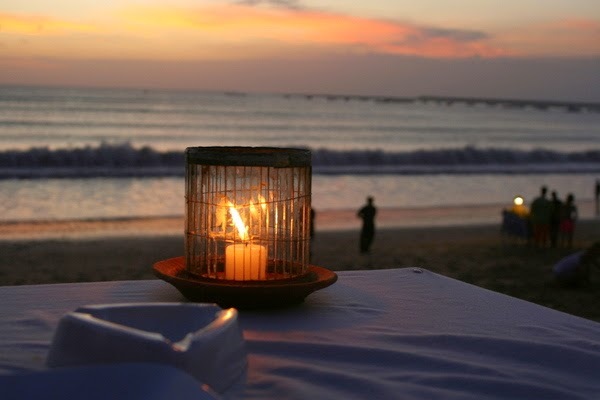 We love the Kuta beach totally and we captured many evenings of wonderful sunset. It was really very romantic. Compared to Singapore, Kuta is much cooler because it has a long broad Indian Ocean beach-front. One tip we surely want to share about using taxi is: It is important to ensure the taxi driver understands where you want to go. And make sure he turns on the meter. You know you should not be paying extras or surcharges. If the driver is not agreeable to using the meter, it is better you get off and wait for a next taxi. The Discovery Shopping Mall (Centro) across the Waterbom Park (Jl Kartika Plaza in Tuban) is one of the bigger malls where we did most of our shopping. Lots of international brand stores. The other place we regularly went was the restaurant and café. We bought wireless Internet cards at the hotel, but the speed was not the best. So we regular the restaurant near our hotel to access the Internet. My husband had a great time doing this surface water sport called Boogieboarding. It is also called ‘Bodyboarding’. Bodyboard is a rectangular short hydrodynamic foam that you can rent. He went to rent it almost everyday out of the 14-day honeymoon trip. He is not really a pro, so he didn’t use those swim fins for extra propulsion and control. By the way, it is a good exercise and he enjoyed this activity very much. Other safety tips other than swimming safety and noting the special flags for prohibited swimming areas, you need to watch your belongings. There are many touts hassling you to take up motorbikes transport. It can be rather annoying after too many offers and saying ‘no’. You just have to stay firm and calm. Outside bars, there are pickpockets. So be really careful when you are walking on the sidewalk. A very popular problem is the Foreign Currency Scams, go to a reliable source to exchange for rupiah if you ran out of cash. As we booked the taxi driver for the entire day, we also visited Central Bali, Ubud. Along the way, the taxi driver stopped for us to take some photos of the rice paddies that are gently rolling with lots of greenness and beauty. I didn’t really like the Monkey Forest. The monkeys are known to be great at stealing your possessions or things in your handbag – glasses, cameras or even food. They are very playful and they could climb on your shoulders, tug on your shirt. On another day, we visited South Bali and really like what we saw in Jimbaran. Between Kuta and Bukit Peninsula is Jimbaran, we also went to the Uluwatu Temple to the southwest. The most memorable was the fire-grilled (bakar) seafood dinner on the beach. While waiting for our chosen seafood to be prepared, we watched the beautiful sunset as we were seated right infront of the Jimbaran Bay. The beach has fine white sand. Another must do is to watch the cultural performances in Bali. They are the Barong Dance which lasted for an hour. Quite a nice performance about the battle between good and evil.